For supply only wardrobes, we can deliver to all mainland parts of the UK. Wizard Wardrobes is a family run business that has specialised in interiors since 1986. What does a standard wardrobe comprise of? Whether you choose supply only or supply and installation – your wardrobe is supplied with a full front frame comprising of strike plates for the sides of your wardrobe as well as floor and ceiling plinths for the top and bottom tracks (these help to plumb and level the front frame) As mentioned in the section above these can be removed at your request if you only require replacement doors and tracks. Wardrobe interiors are optional and can be chosen in our wardrobe designer. What if I only need replacement doors? 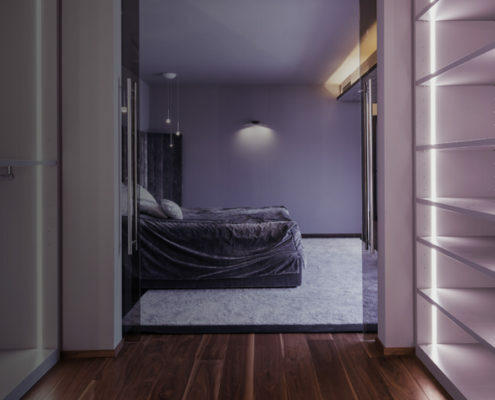 All of our doors have no specific sizes and are completely made to measure, so if you have an existing wardrobe that works well for you but is looking a bit tired then we can help. Replacement doors are available for both sliding and hinged wardrobes. What size are the doors? All of our doors are completely made to measure! Our doors can be manufactured suitable for opening heights of up to 2700mm (8 foot 10 inches) without the need for any infill panels! Our doors and tracks are suitable for opening widths of up to 5270mm (over 17 feet) Door widths are achievable up to 1500mm (5 Feet). What if my floor, ceiling or walls are uneven? Don’t worry if your walls, ceilings and floors are uneven, as we will level both the top and bottom tracks and wall abutments. We can use an L shaped wall scribe to compensate for any unevenness and not a flat scribe which many of our competitors use (leaving you with uneven gaps to the sides of your wardrobe). We will level the wardrobe frame so all the doors are plumb in all positions and not just so they appear correct in their closed position! What’s the difference between the door types? All Wizard Wardrobe doors are manufactured using high quality slim brushed aluminium doorframes; the ultimate in quality sliding door hardware. We do not supply inferior quality steel framed doors. Doors are available to suit all budgets and tastes, all of which are aluminium framed which is widely regarded as the sturdiest most reliable type of wardrobe doors on the market. All together we have 10 different types of doors suitable for use in many ways for bedroom, bathroom and kitchen as well as a glazed system suitable as an alternative to tiles as a splash back in the kitchen or bathroom, decor end panels to make a special feature or for something very special a full wall cladding system! No, by removing the need for expensive showroom overheads we are able to provide better value. Our experience is in the acquisition of high quality products and commitment to delivering a high end but cost effective product tailored to your individual requirements. We can however introduce you to many satisfied customers who have agreed to allow potential customers like yourself into their homes. What better endorsement could you have for a product and service than to actually speak to one of our customers first hand? 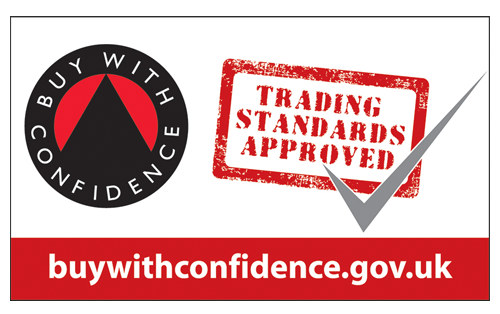 Yes, we can confidently offer a TEN YEAR guarantee on our wardrobes which covers both the running systems from failure or defect, any colored glass form de-coloring or mirrored glass from de-silvering. 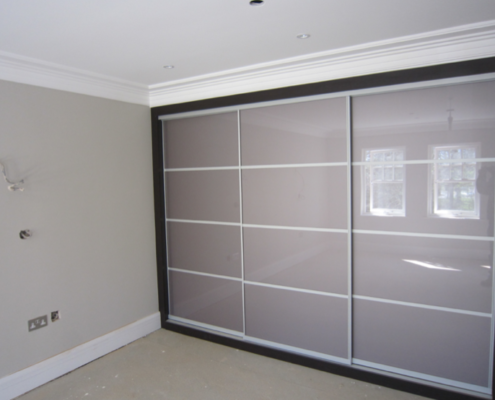 Our wardrobe designer has options for both installed wardrobes and for wardrobes on a supply only basis. You can also choose if you require a wardrobe interior or not, as sometimes you may just be looking for some replacement doors for an existing wardrobe. The price for doors on a supply only basis includes for a front frame consisting of strike plates to the left and right-hand side of the opening as well as floor and ceiling plinths. If you do not require these, they can be removed from your order when it is processed. What if I have a high ceiling? Depending on how much higher it is, you can choose to put either a top-scribe in place, allowing you to still use the full height inside your robe, or fit a lid, which closes the top of your wardrobe. If you think you may need this, please call or email us. 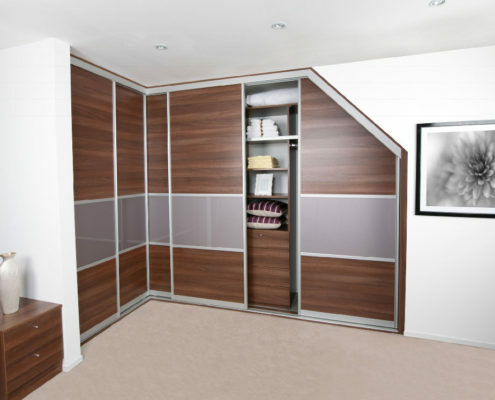 All of our wardrobes can be installed by our fitters or you may wish to choose supply only doors and interiors. Do you send samples of the colours? Yes, we do, if you require supply only we will post samples on request to help in your decision-making. Alternatively, if you require your wardrobe installed we will run through the many finishes during a no obligation designer appointment.